There are so many restaurants on Denman Street that I tend to avoid venturing in to that part of town unless recommended to a particular one. When I was asked if I wanted to check out the VanEats package for Kingyo Izakaya I was intrigued by what they were offering so grabbed at the chance. There I was on Denman Street, GPS on my phone as I navigated through the “unknown” looking like a tourist. Upon entering the restaurant I was impressed by their decor, their open-concept kitchen (normal for Japanese restaurants) and their friendly staff. After bee-lining to the bathroom as soon as I was seated, I found myself also impressed by their fully equipped bathroom: Q-tips, feminine napkins, mouthwash and hand lotion. I could solve any problem in a heart beat in this bathroom. A sucker for mouth wash I gurgled a bit before making my way back to my table where my boyfriend James was patiently sitting. I’m sure he appreciated my fresh tasting mouth as the usual aroma that escapes from it is of vodka, gin, onions or garlic. That minty mouth of mine was quickly masked by the taste of Sapporo after James, my friend Stephanie, and I decided to share a pitcher. The chilled glasses were appreciated, as was the waitress returning to fill our glasses. Of the three of us I was the only one that ordered the VanEats package, which was great because we got to try more things on the menu, like their Invincible and Undefeated Tan Tan Noodle and their Deep Fried Chicken Breast Tender. Kimchi marinated tomatoes on greens with tofu and ginger. Served with sesame soy dressing. Every time I eat tofu I hope that it will taste better than it looks: an off-white, block of soy protein with a weird texture. Alas, its flavour often mirrors its appearance and it has very little flavour despite it’s porous and sponge-like texture. A little bit of sesame soy marinade on the tofu would have taken this dish from okay to great. It’s odd that they would marinate the tomatoes but not the tofu as the tomatoes were tasty and would maybe even convert a tomato-hater in to a tomato-lover. The greens were quite heavily doused in dressing but because it was a vinaigrette and not a cream dressing I enjoyed it with the bland tofu. The radish and Kaiware sprouts added a crisp texture and slightly peppery mouthful, while the goji berries added chewiness and a mild tangy taste. Lightly seared tuna tataki with ponzu & ponzu jelly. I really enjoyed Kingyo Izakaya’s tuna tataki, finding it to be better than those that I’ve had at Japanese restaurants lately. The tuna was firm and not mushy like you find at some restaurants which is a make it or break it factor. It was seared gently and seasoned slightly and with a little ponzu and ponzu jelly I could’ve kept popping them in to my mouth. Alas there were only three pieces so I was left to look longingly at Stephanie’s heap of tuna tataki that put the presentation of mine to shame. Loved the addition of garlic chips and green onions for flavour and texture. If you’re not familiar with ponzu it is a semi-tart, citrus-based sauce that is thin and a dark brown like soy sauce. It contains mirin which is composed of 40-50% sugar thus giving it a hint of sweetness. It’s salty from the addition of soy sauce and “fishy” from the seaweed and katsuobushi flakes, which are flakes of dried, fermented and smoked skipjack tuna. The ponzu jelly is essentially just a thickened ponzu due to the added kuzu (a starch). Stone grilled marinated kobe beef with Kingyo’s original two kinds of special sauce. Whether it’s Kobe beef or actually Wagyu beef like many articles claim about the fabled meat in Canada, this beef is damn good. Having never been to Japan I can’t attest to the fact that it is or isn’t but I can tell you that it has the same consistency that Kobe beef is described: soft, tender and laced with fat. The meat was extremely flavourful and only needs to be cooked for a minute on the hot stone. As everyone is warned the stone is hot, trust me, curiosity got the best of me. I love the do it yourself aspect as you are in control of how well done or rare you eat it. Plus it just looks cool having a big stone on your plate and some sizzling meat emitting a stomach growl inducing odor. Both sauces were nice but I favored the garlic over the spice finding that it enhanced the flavour of the meat rather than overpowering it. For a regular portion of this dish it is just under $20 so it’s nice to sample it as one course of a four course meal for $22. Ramen noodles in original soy based clam soup with shrimp oil, garlic onion oil & fish powder. I’m not a big fan of clams so this wasn’t my favourite dish, especially after having the amazing Tan Tan noodle dish. I felt that the noodles in the clam ramen were softer than they should have been, as they were perfect in the Tan Tan. There were five clams in this dish which added to the presentation and further enhanced the clam flavour. For me the presentation was better than the taste; I loved how the dark bowl contrasted with the pale noodles, clams and garnish. Basically if you like clams and fish powder you’ll like this, but if you don’t…maybe just pass it on to your friend. Sharing is caring, right? At the end of the meal with the bill they brought out a flower and three frozen grapes, one for each of us. It was a nice touch and (almost) satisfied the sweet finish that we were craving. This is the second package that VanEats has collaborated with Kingyo Izakaya with the last package consisting of five course in Fall 2011. For more info on Kingyo Izakaya or to see their menu check out their website. 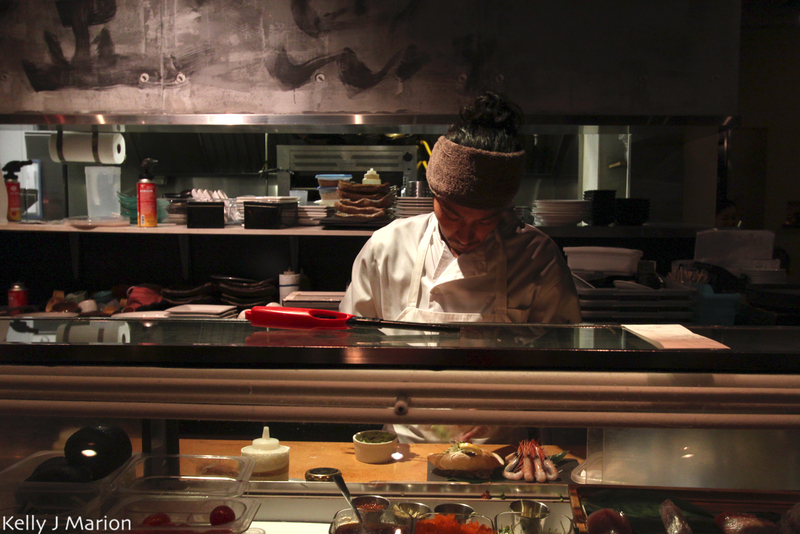 For more photos check out my Kingyo Izakaya gallery on Flickr. To buy the Van Eats #SimplyKingyo package for $22 click here. Hurry because it’s only available until November 30th!